When you are looking to make the move to a physical office, an office space rental in Mississauga or your locale is often the best option. Moving to an office space can be a difficult, time-consuming, and frustrating experience. Many entrepreneurs and business owners are put off from moving into an office, even though they really do need one to accommodate their growing businesses. Office rentals seek to make it easier for companies that aren’t major corporations to also enjoy the benefits and perks of a fully furnished office. Here are some of the top benefits to renting a fully furnished office space. Furnishing an office is incredibly expensive. Purchasing and installing the furniture, equipment, and technology needed for your office can easily run into the tens of thousands, or even higher, depending on the size of your company. Fully furnished office rentals allow you to rent a space which already comes with everything you need and can be rented to you at a fraction of the price it would take to furnish your own office. As well, most rental offices will include amenities and services that you would otherwise have to pay for, such as Wi-Fi or reception services. Using an office rental allows you to save money on a variety of amenities. Furnishing and moving into an office can be a months-long process. 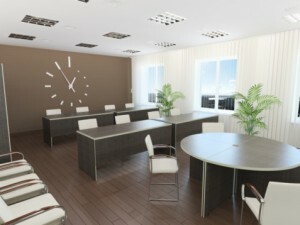 With an office rental, you can eliminate the time you would have spent setting up your office and waiting to move in. There is no setup or lengthy waiting process involved, so you end up saving a lot of time that otherwise would have been wasted. As well, office rentals allow you flexible arrangements that can fit your needs. If you only need an office for a specific period of time, such as a peak season with your company, a short-term office rental in Mississauga can grant you access to an office space at an affordable rate. You can rent an office for however long you need it and move in right away. Presenting a professional image is important to any company. Having an office is often seen as a sign of a successful or “serious” company, particularly when compared to a company that is operated out of someone’s home. Fully furnished office rentals offer a working space with a modern design, full amenities, and high-end technology, presenting a professional work environment. As well, receptionist and phone-answering services, along with other assorted services, can give your company a professional edge that sets you apart from the competition. It is very likely that you will need to upgrade your office space to accommodate new employees as your business grows. This can be really tricky and expensive with a traditional office suite. One of the biggest benefits of a furnished office rental is that you can easily move into larger suites whenever you need to, avoiding the hassles of moving and furnishing all over again. With an office rental, you can always easily ensure that your office space is the one that meets your needs.